FONTANA, CA – Fontana Unified added two electric, zero-emission buses to its fleet that aim to reduce air pollution and transportation energy costs, thanks to funding and support from local and state agencies. Fontana Unified is among 16 school districts across Southern California to receive funding for two electric vehicle (EV) charging stations and two buses. The District’s new EV Blue Bird Type D buses can accommodate up to 72 passengers and travel 100 to 120 miles on a full charge. Funding and rollout support were provided by the South Coast Air Quality Management District, the California Environmental Protection Agency, the California Air Resources Board’s Hybrid and Zero Emission Truck and Bus Voucher Incentive Project and Southern California Edison (SCE). The Blue Bird buses will reduce exposure to smog-forming pollution, reduce costs for fuel, oil and transmission fluid, and offer longer use of brakes. The vehicles feature 18-inch aisles – more spacious than the standard 12 inches – to offer comfortable student mobility, as well as an electric motor that provides a quiet ride. In addition to reducing air pollution, the buses will also decrease maintenance costs for the District. 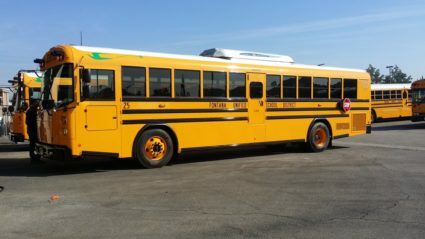 According to SCE, propulsion system maintenance of an EV school bus costs approximately 25 percent of what traditional diesel bus maintenance costs. Fontana Unified received additional support from the nonprofit CALSTART, made possible in part by a $75,000 grant from Edison International, offering account management services and technical assistance with installing the charging stations. FUSD_ELECTRICBUS: Fontana Unified added two electric buses to its fleet, reducing air pollution and cutting maintenance costs.